With beautiful descriptions, sparkling dialogue, action-packed pages, and a strong heroine who grows into her power as the story progresses, QUEEN OF JASTAIN has everything a reader could ask for from a time travel romance. This well-written tale kept me reading well into the night, cheering for Abby and rooting for her happily-ever-after.The novel starts with a bang in present-day Texas, where we meet spoiled little rich girl, Abby Randall, moments before her former best friend delivers a gut-wrenching blow with her engagement to Abby’s ex-fiance. In the ensuing maelstrom of emotions, Abby is somehow transported through time to a medieval kingdom, where her cute little car is sorely out of place and her designer mini skirt and high-heeled Dolce Gabanas are even more of a problem.Enter the handsome knight, whom she rescues from pursuers on horseback. Avant has waited for so long to avenge his kingdom, but didn’t expect the champion of prophesy whom he was waiting for to be… a woman. Especially not a beautiful woman with whom he is so completely and utterly captivated.The tension between Avant and Abby practically sizzles on the page, especially since Abby’s a thoroughly modern woman, and Avant a chivalrous medieval prince. Ms. Rader alternates the point of view between Abby and Avant, so the reader is privy to the sexual tensions mounting on both sides of the equation, and to the frustrating situational misunderstandings that arise and come between them.When I was younger, I had a real thing for King Arthur and medieval-type stories. One of my all-time favorites is A Connecticut Yankee in King Arthur’s Court, by Mark Twain. Not that it’s a great Arthurian tale, but I love the time traveler aspects to it, and the juxtaposition of the modern guy thrust back in time to the Middle Ages. The narrator’s quirky humor provided a fresh perspective on all things medieval.In QUEEN OF JASTAIN, Abby’s dry wit and self-deprecating humor reminded me of Twain’s narrator, and had me smiling along with her as she navigated the strange landscapes of Jastain.Bottom line? I loved this book and totally look forward to reading more from this author. What a fun ride this is! With an Advanced Readers Copy, I got to read this new book, which releases on 4/15/13. I loved the characters and world that Rader created. With a heroine quite different from any I've read, Rader brings a new dynamic into the fantasy genre. Abby is spoiled and at first appears shallow, albeit sympathic. However, the idea of her saving anyone, least of all a displaced king and his kingdom, seems ludicrous. Ah, but wait! Abby has hidden depths and Rader creates a fantasy heroine who blossoms delightfully in her new world. Even as I rolled my eyes at times at some of Abby's silliness, I also rooted for her right from the beginning. She has an endearing quality that brings her to life and keeps those pages turning. Rader did an awesome job writing her.Avant, the male lead character, is also interesting. Conflicted, loyal and honor-bound to the Nth degree, he walks a serpentine path to his "destiny." Overall, this story is fun and well-written. Rader's plot has twists and turns that don't end up where you think they will. The writing is crisp and smooth. This is a fast and easy read.Highly recommend! Queen of Jastain was amazing. I was totally captured be her descriptiveness of the surroundings....it was a wonderful escape!! I found myself lost in the land of Jastain!!! I loved the story of Avant and Abigail, the interesting twists, the struggles and the victories. The attainable love, that is just out of reach...kept me turning pages!! The intricate story line was the best...every time I thought I had it figured out it turned a different corner, that was awesome! 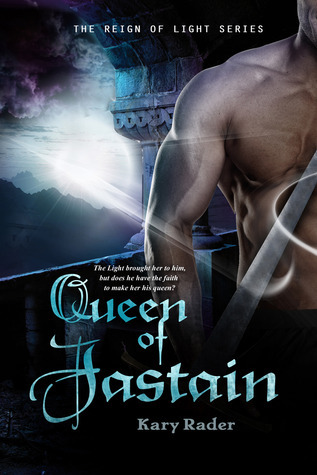 !I would highly recommend Queen of Jastain by Kary Rader!!! I received this book free through Goodreads First Reads.Queen of Jastain was pretty good. It was quirky, interesting and a little corny but overall a quick and easy romance read. The only thing that bugged me was the female lead had some annoying tendencies. I really dislike when female adults giggle ALL THE TIME. Other than that, I liked her. The stories concept was exciting and the romance was your typical one. 3.5/5.0A finely crafted world, with some nice twists.Read full review in the 2013 June issue of InD’tale Magazine.